Luckily, this story has two happy endings. 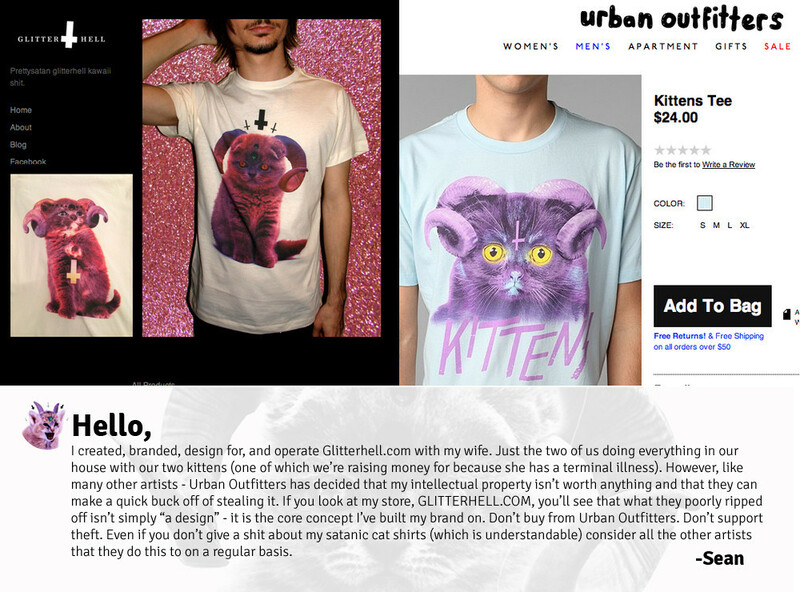 First, according to Glitterhell’s blog, UO has pulled the shirt. They agreed that it was too similar, and pulled it from their stores and website. The second part of this happy ending is all about me finding out about this company. I love finding new independent merchants that put their love of cats on display. Click through to see some of their occult kitty designs. FLAUROS Unisex pink contrast stitch, $25 Since this is work/child friendly, I’ll probably get this one. CAIM Destroyed White Crew, $25. This is the I am totally in love with. It would probably scare children, though. HALPHAS Ivory Crew, $25. This is the design that UO decided to rip off. Balaam 3/4 Women’s Hand Dyed, $35. This one needs to be mine too. Glitterhell has more amazing shirts available on their website. I seriously suggest you check it out. Especially if have an itch for fashionable feline apparel.